PagetoScreen - InDesign CC for print and ePub from the Same File? Master Page items are ignored in ePub. TOC is on the pasteboard. Rule is used with an offset to create the background grey on the heading (ACT I). This needs to be put back with the background-color rule in the CSS of the ePub. Split ePub at the major heading. Start paragraph on next page results in CSS that forces a page break. Align to Grid may give a false impression of spacing that will not appear in the ePub. Is it possible to use InDesign creatively so that the same file will produce good quality print (PDF) output, and then, with no modifications export for ePub3? Often times, book publishers will have their design studios working with InDesign to produce PDFs for print output. At the end of that workflow, comes the decision to create an eBook version. It is sometimes the case that the book designer has used InDesign in such a way that creating the eBook by exporting from InDesign is impractical unless the file is re-worked, with changes to the styling rules; the removal of style overides, the choice of a different font, the anchoring of pictures etc etc. Through work conducted with my students on a Masters programme in Digital Publishing (OICPS), I have been exploring this challenge, since their stepping through the sequence of assignments goes from PDF for print > to ePub3 re-flowable (and beyond to a fixed-layout version). Phew! What are the pitfalls and can book designers change their habits so publishers will not need to outsource this work? Just a few facts first. InDesign is a great wysiwyg page layout tool, but the what-you-see-is-what-you-get only applies to the print or PDF output. You won't see exactly the same in the resulting re-flowable eBook. Re-flowable ePubs need certain constraints, that PDFs do not, but these constraints are not disadvantageous for the print/PDF version; anchored images (a requirement for the ePUB), will still afford the flexibilty of position that you may need in the print version. 'Drag and drop' was your friend, but now it could be your greatest enemy. If you use a book panel with book chapters as separate files, the technique for exporting to ePub is slightly different. I will explore this in a later article. If we are starting the production of an eBook without even considering print, then we might start an InDesign file with a 'Digital Publishing Intent' - giving us a page size of 1024x768px portrait for the iPad. Good, if you want to simulate the appearance on the iPad, but really not required at all. So if your page is set up as a 'real' book size: eg. 156mm x 234mm with margins of 24mm top and bottom with 18mm and 16mm inside and outside, then fine for a re-flowable eBook. Conclusion: Leave as is - you don't need to change the page size. Re-flowable eBooks are normally viewed portrait. Although the iPad does give us a side-by-side view in landscape mode, this is not the same as spreads that you may see in your InDesign view. You can use spreads in your InDesign file for your print /PDF purposes, but these spreads will not result in a spread view. If your print book is designed as landscape pages, you can leave alone, but your eBook will look nothing like the print version unless you build a fixed-layout eBook. Conclusion: Leave as is - spreads can stay, the exported ePub will show in portrait. Spreads in InDesign are ignored on export. The cover of the eBook can be any shape that you like, although a landscape shaped cover will probably be shrunk down very small in a typical eBook library thumbnail view. It is likely that InDesign creatives will have cover files separate, maybe as wrap arounds with spine and flaps. You need to extract the front part from this and link at the point of export to ePub. But, one thing you will need to address if you use this method - the image must be in RGB format - InDesign will not convert this linked image when exporting to ePub. Remember, covers are often seen in thumbnail views, so make sure the title can be read at small sizes. You will need a large version of the cover for marketing purposes when you deliver through the Apple iBookstore. This needs to be 1400pixels on the short side. Conclusion: Some changes may be required, but the cover is often not included in the main InDesign file for print; it is more liekly to be printed separately. When you export to ePub, all of the master page items are ignored. headers, footers, page numbers etc. They won't get exported. Conclusion: leave your master page items alone. Probably the most difficult of all, is dealing with page beginnings and ends. Book designers will often have finely crafted their InDesign files to get an exact number of pages (book extent) and will have adjusted leading and font spacing to remove orphans and widows. Since many of these adjustments will be ignored, they can stay, but some old habits need to be expunged! For example, if a soft break has been added near the bottom of a page (to remove a paragraph widow), then this will be a disaster in the eBook. It could result in a sudden break in the middle of a line. 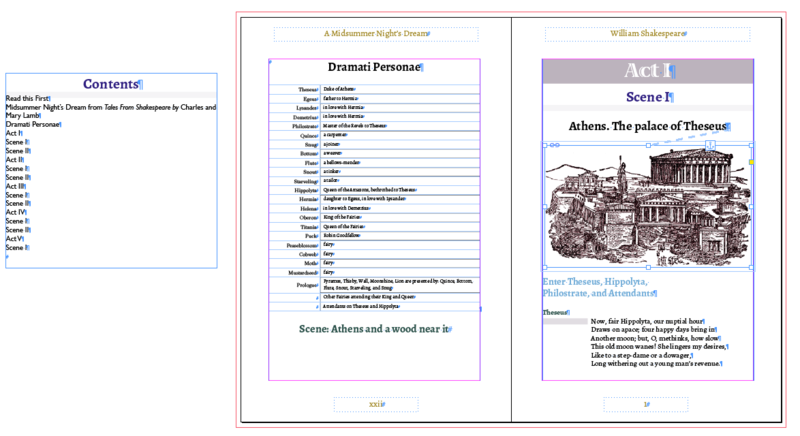 It is essential that the book design uses a different technique in InDesign. I advise using the keep together options in the paragraph style rules. This should tackle your orphan and widow problems for the print version and will be delivered as CSS rules in the ePub3 file (orphan and widow control has very limited support in eBook readers). You will certainly want your chapters to start on a new page. For your print version you may have used keep options > Start on Next page. This is good for print, but you will also need to use 'split ePub' for the heading style in order to 'chunk' the ePub into different XHTML files (one for each chapter, typically). This may be very useful where you have a sub-heading that needs to start on the following page, but if you use 'start on next page', and 'split ePub' for a heading style (say a chapter heading), then you will get a blank page! Conclusion: You can edit out the 'page-break-before:always;' CSS at the end of the process. This could be the subject for a much longer article but generally, if your licences allow it, then you can embed the fonts that are used in print into the ePub. However, not all font types are supported in the ePub, and - further, not all devices support all fonts. Conclusion: You will need to experiment. You may need to compromise the print version in order to achieve the desired ePub version. On the other hand, you can opt to export without the font embedding, and thus, depend on the eReader device fonts. 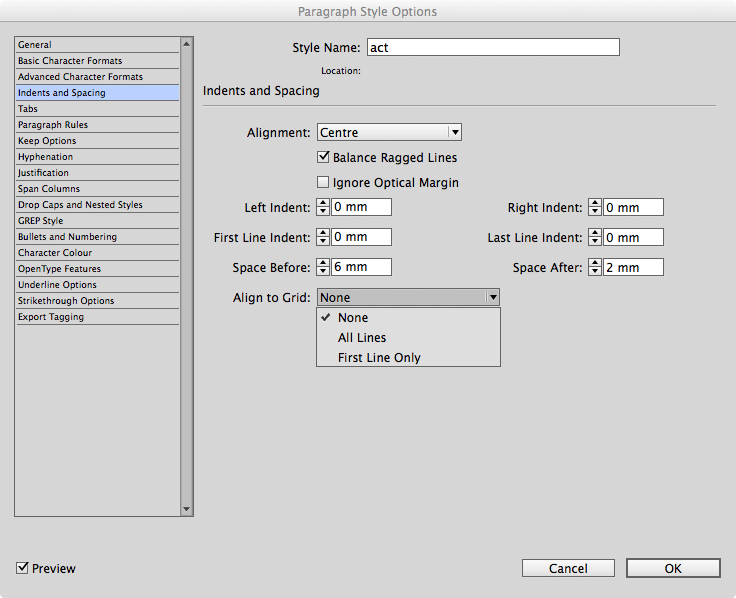 There are many sophisticated typographic controls available in Adobe InDesign, and you may have been using baseline shift, hyphenation and justification fine controls, and even Align to Grid. All of these attributes will be ignored on export to ePub. If you make a lot of use of 'Align to Grid' and have set up a baseline grid across your spreads, then you need to be aware, that, even though spacing between paragraphs and heading looks great for print, you are going to lose this spacing when exported to ePub. You have to find another way to get the correct spacing. 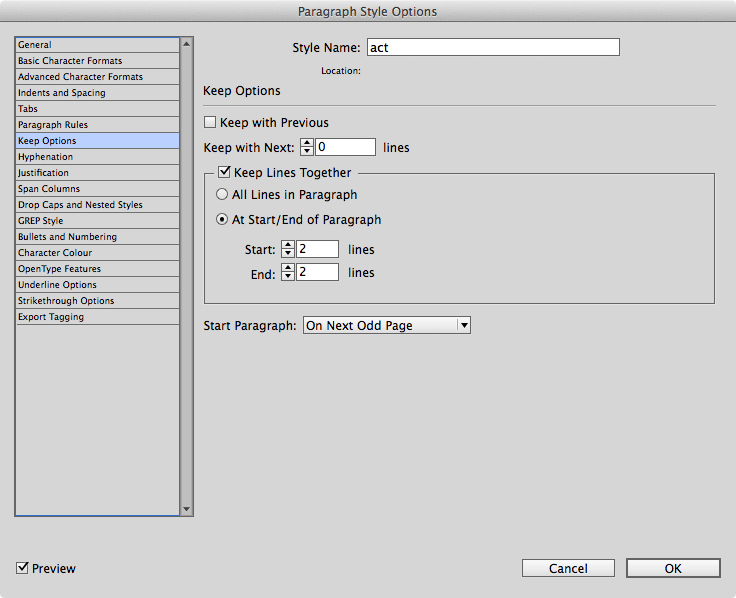 Use space before and space after in the Indents and Spacing section of the paragraph style attributes panel. Conclusion: Not all of your fine controls will work in the ePub, but, no-matter, in most cases you can ignore, but be careful with alignment to the baseline grid, since you may think you have good spacing, but this will be gone in the ePub. If you have photographs or other images in the book for print, then you must be sure to anchor these images, so that they will be closely tied the place in the text, when exporting to ePub. It may be that an image is moved on to a facing page, because it does not fit in with the layout concept of the book. This should not be a problem. A picture can be on a previous page but anchored to the text on the opposite page. You will need to use 'Anchored Object Options' with a Custom Position that allows you to manually arrange. When you export to ePub, you have a range of options for images, but if you opt to Use the Original Image, then you will need to convert those images yourself to RGB jpegs or PNG files. A better option is to use Preserve Appearance from Layout and Relative to Text Flow. It is a good practice to include alternative text for images within the ePub file. You can get this to work most efficiently if you use metadata within the images themselves. Use Photoshop to add metadata (title, description etc). You can pull this metadata into your alternative text automatically, and, even use in the captions. Conclusion: InDesign CC does a good job with images on export to ePub, but there are some important details you need to consider. For the best results for the simplest of books, is to be sure that all text if threaded in one 'story'. For print book designers who have placed text boxes here and there throughout the document, without anchoring them or threading them into the main story, I have to say, you will struggle to get a good ePub from InDesign. Change your approach. Anchor those text boxes at the appropriate places in the main text, but please get out of the habit of creating headings with separate text boxes and drag/dropping them onto the page. This simply has to stop! Include the text in the structure. Not only will this give the better ePub results, but you also need to think about the table of contents (next section). Conclusion: Text threading and structure of content does impact significantly on the resulting ePubs. Do try to keep your text threading simple with objects anchored inside those text frames. Multiple stories are possible, and you can use these stories as a way of ordering your 'articles' - which in turn can be used as the Content Order when exporting. Threading and content order should not change the PDF output. You may (indeed are likely to) have a table of contents as part of your front matter in the print book. In the eBook version this needs to be interactive, so that users can navigate to their chosen section or chapter. This interactivity will only work if you have used InDesign's clever way of creating this TOC from the heading styles. You must use Layout > Table of Contents to build this TOC. Technically, there is no need to have the TOC displayed on the page at all, so you can create on (or move to) the pasteboard. Some publishers do prefer to include the TOC on the page as well, but generally this is not required and is doubling up without reason. On the other hand, you might add summary information to the TOC, and then you are really adding value to the page based version. If you do use a Table of Contents on the page then leave off the page numbers, since they are dynamically changing. Conclusion: There are some changes that may be required when building the TOC. InDesign CC does have the feature of saving versions of the TOC, so you can have alternatives to choose from when you export to ePub. Avoid, at all costs editing the XHTML files inside the ePub package, otherwise you make it difficult to 'round-trip' to InDesign. What you should do is to edit he CSS file and then create your own from this base. 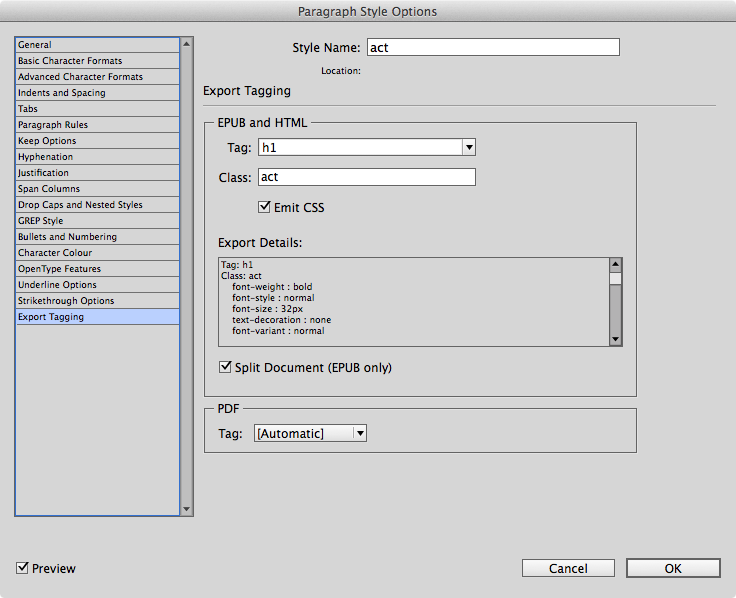 Export again from InDesign and link this CSS file. Style rules are then overridden by your version.